Hello! Today i thought of doing an EOTD on my blog. This is my first EOTD, i hope that you all like this. Feel free to comment below if you love this, or want to correct any of my mistakes. I hope this will be a good one. Eye Shadow Base: Maybelline FIT ME concealer, paired with Maybelline White SuperFresh Compact. First I applied Blue Eye Shadow Crayon by Elle 18 (discontinued), you can use this instead on the lips and used my fingers to smudge it. I again applied it to build up the intensity. I set the blue crayon stick with a blue eyeshadow from my Meis Pallete. Then I used a light brown shade from an eyeshadow pallete of the brand called "Meis" on my crease to act as the transition color and blended the edges of the blue eyeshadow. I applied a black eye shadow from the same pallete on the outer V of my eye and blended it. I lined my lash line with lakme eyeconic kajal and smudged it as well. 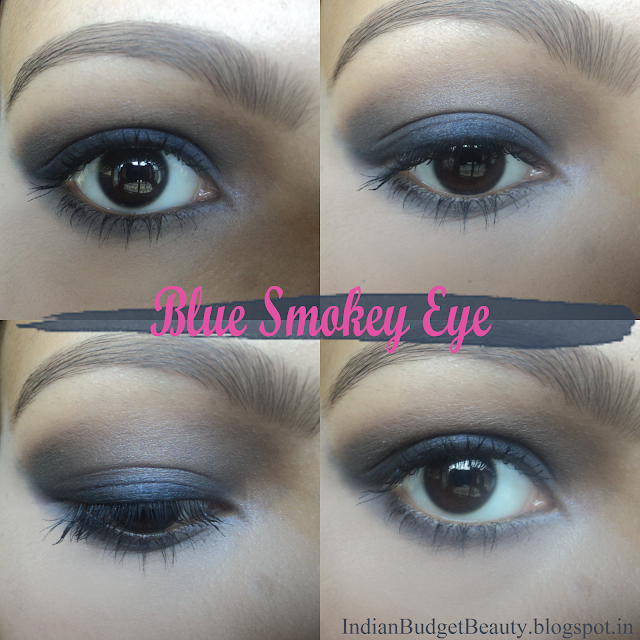 Then by taking a mix of the blue and the light brown shade on a pointy domw shadped brush, i smoked out my waterline. Lastly I applied L'Oreal Volume Million Lashes Mascara on my lashes. After the eye makeup I filled in my brows and applied some concealer and i'm done. Love the eye makeup. Nice photographs.